Stabilizies the foot post operative/recovery. 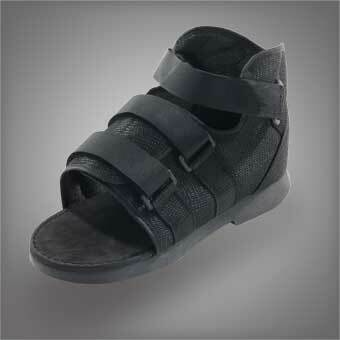 Hi-top design provides additional stabilization of the foot and accommodates foot dressings and edema. The reinenforced heel counter provides optimal medial and lateral control. It has breathable nylon mesh upper and padded collar, with adjustable hook & loop closures with a non-slip sole.